An estimated 900 of the Empire’s best track and field athletes kicked off their season with a 32 caliber bang at the Big Cat Invitational at Santa Rosa High on Saturday. With months of training behind most of the competitors, it was one of the Panther’s own who has only had two days of track practice, who had one of the best performances. 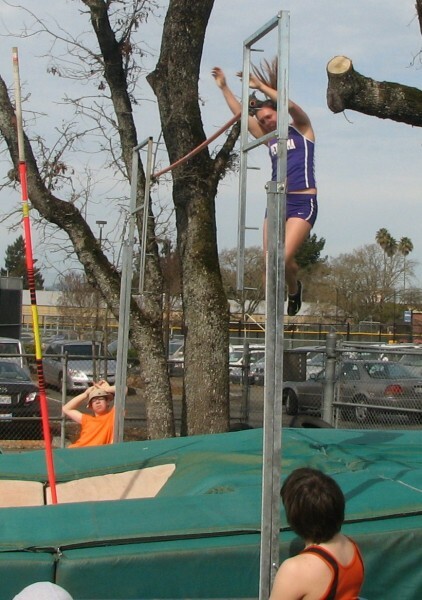 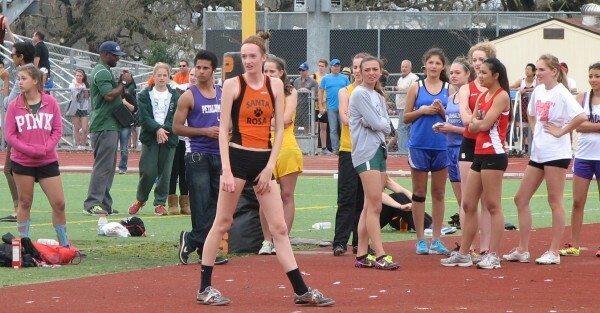 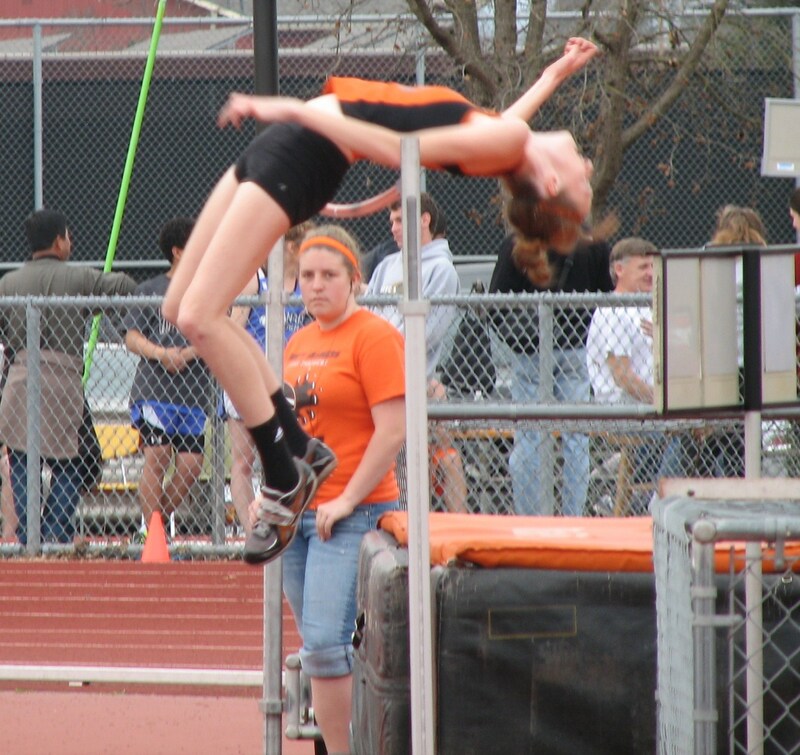 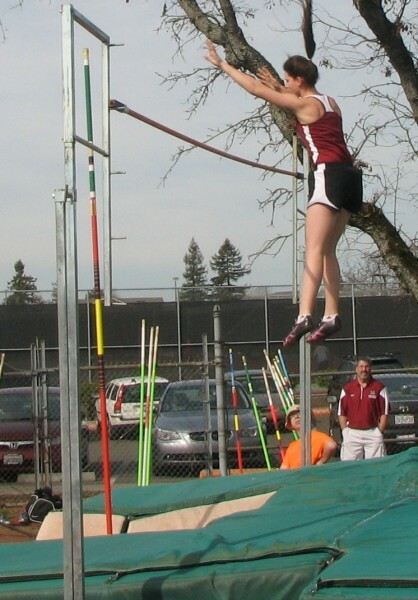 Junior Morgan Bertsch, fresh off the basketball courts, broke the Santa Rosa school record in the high jump with a five foot seven inch clearance. “I was not expecting that at all,” said Bertsch. “I would have been happy with 5-2. 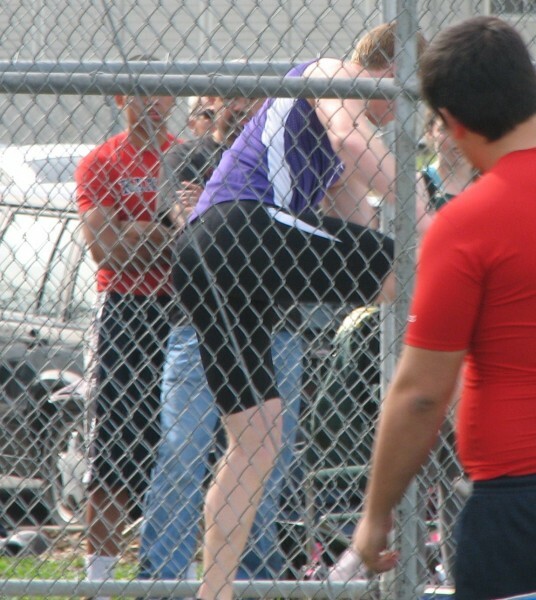 Breaking the record was my season goal, so now I guess I need a new goal like maybe 5-9,” said Bertsch. 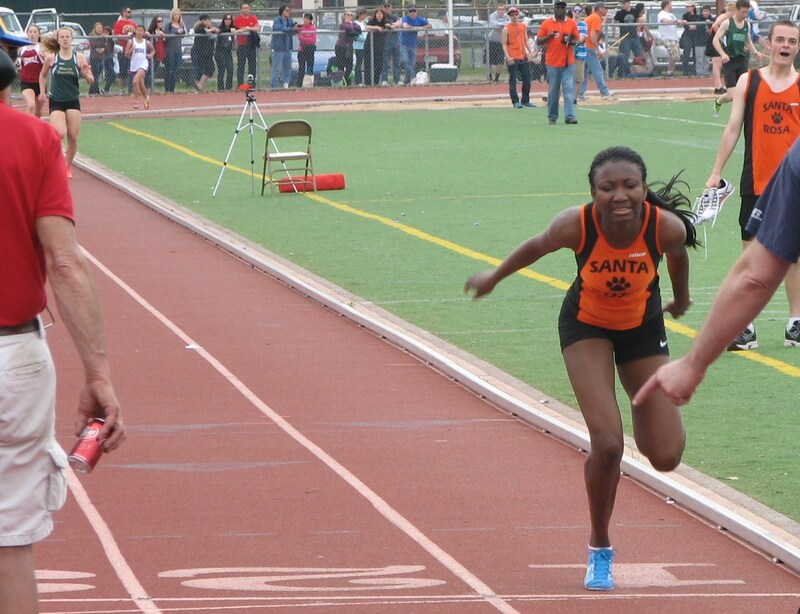 Teammate Sadia Ibrahim was another star of the meet, first winning the 800 meters by a huge 10 seconds at 2:16.45, then coming back to win the 200 in 26.34. 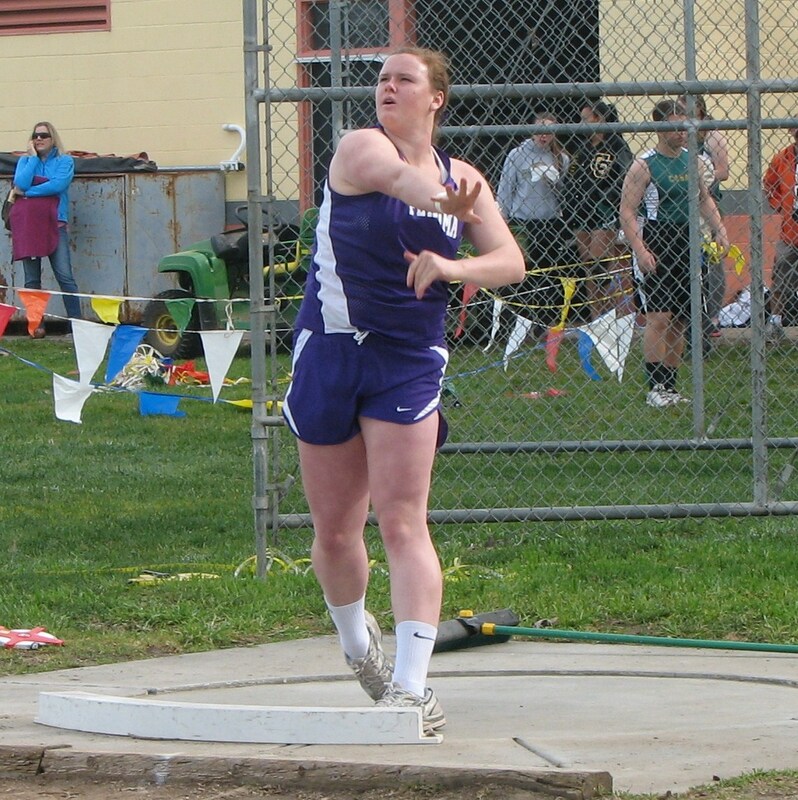 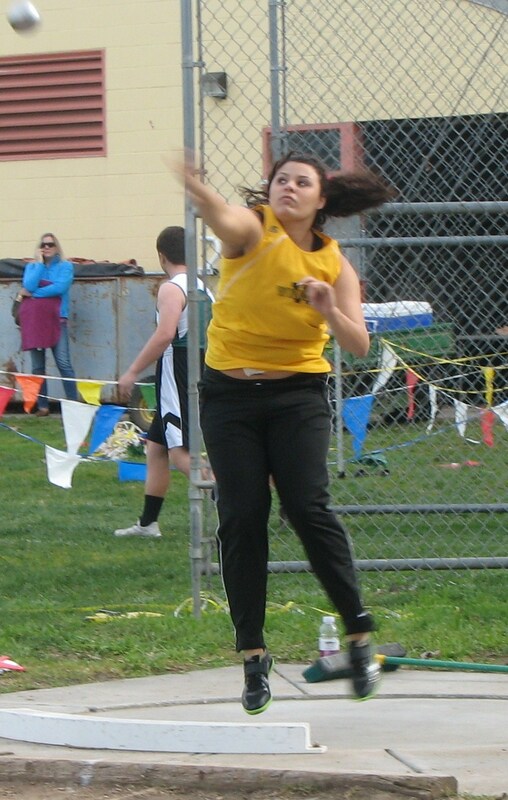 Petaluma sophomore Alison Scranton broke the Empire freshman record last year in the shot put at 37-3¾, but added a foot and a half to her best here on her final throw with a win at 38-9. 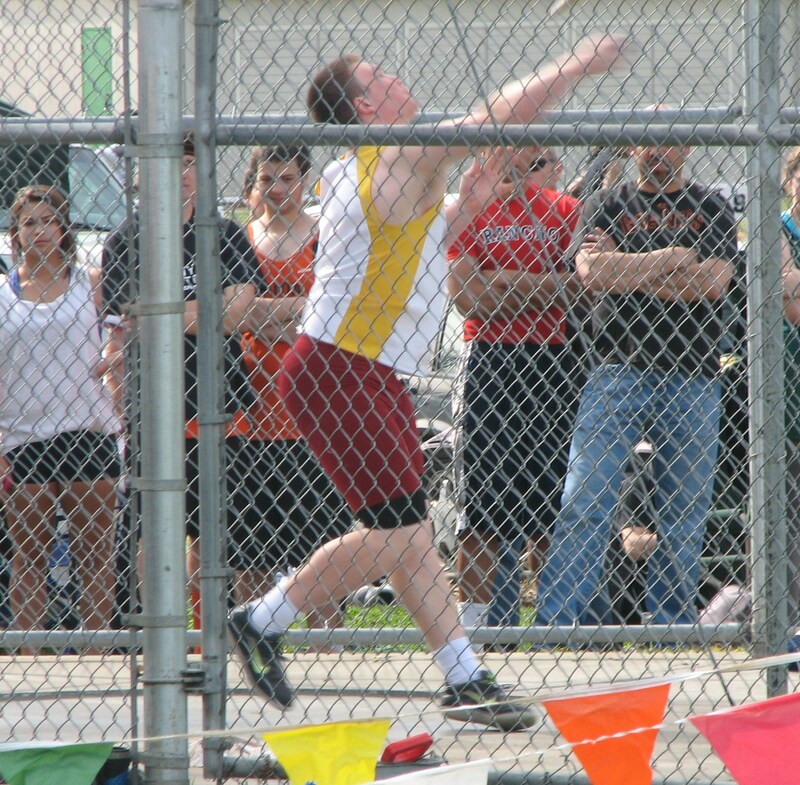 “I was in second place with one throw left and I just wanted to have fun with the last throw.”said Scranton. One of the more exciting battles on the track involved three girls in the 3200 as they battled back and forth down the final 100 meters. 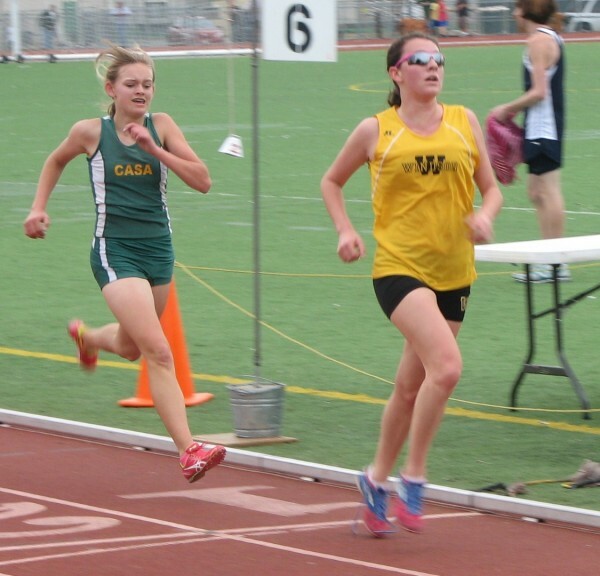 Windsor’s Hannah Haley (11:45.17) edged out Casa Grande’s Saskia Van Ommeren-Egberts (11:45.61) and Maria Carrillo’s Andrea Natoli (11:48.93). 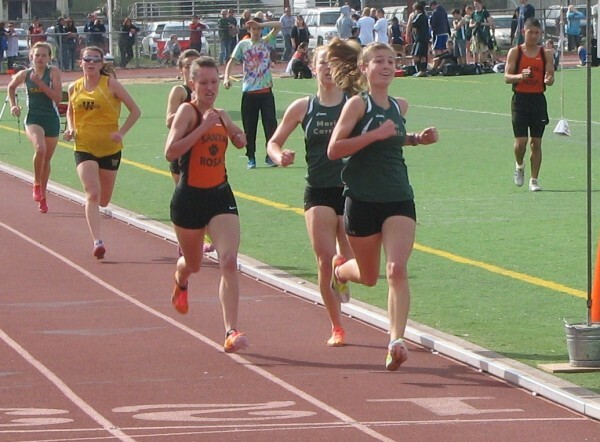 Natoli had earlier won the 1600 in 5:23.41, just ahead of Santa Rosa’s Delaney White (5:23.69) and Maria Carrillo’s Brynna Thigpen (5:23.86). 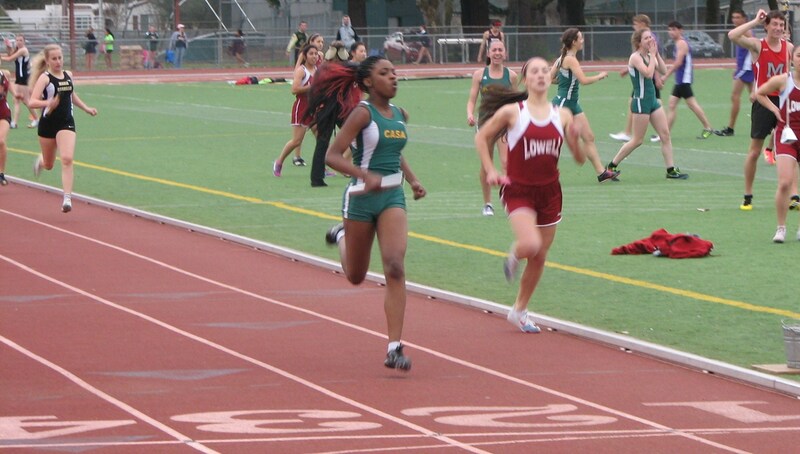 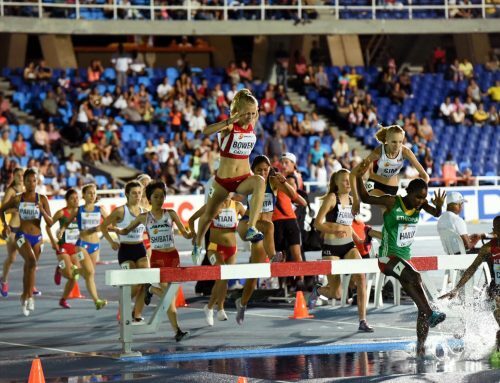 Windsor had two other wins by Amanda Morton (100HH 17.10) and Nicole Kemper (100 13.37). 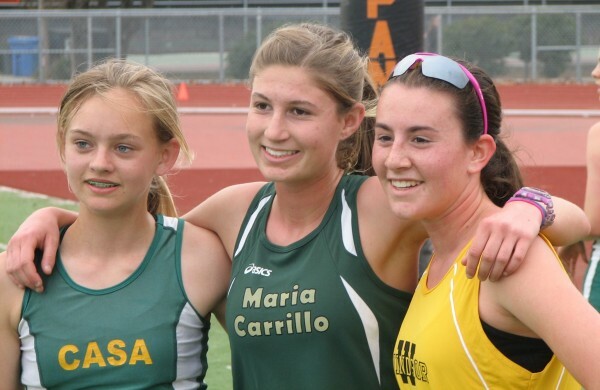 Other local winners included Kathleen Durand, Maria Carrillo (DT 129-9), Jackie Chalmers, Montgomery (400 59.74), Helen-Ann Haun, Healdsburg( PV 10-0), Kiana Herold, Sonoma Academy (LJ 16-6¾) and Eva King, Casa Grande (TJ 36-0½). 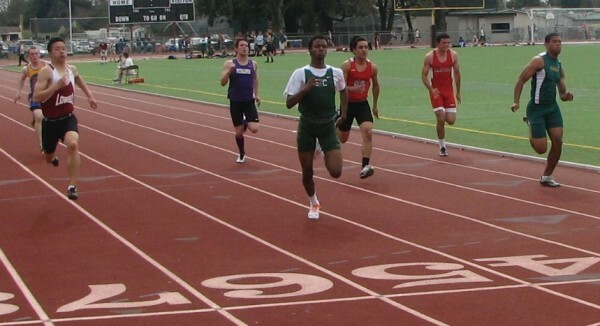 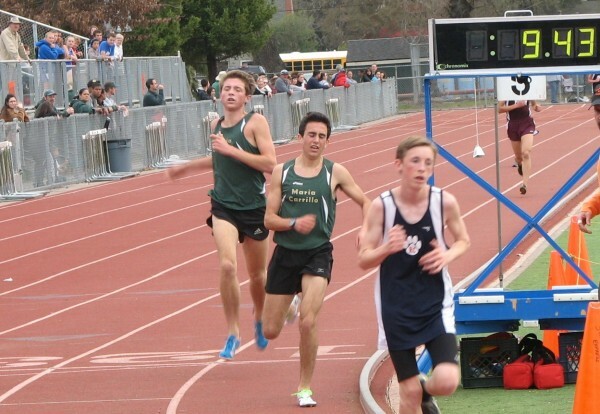 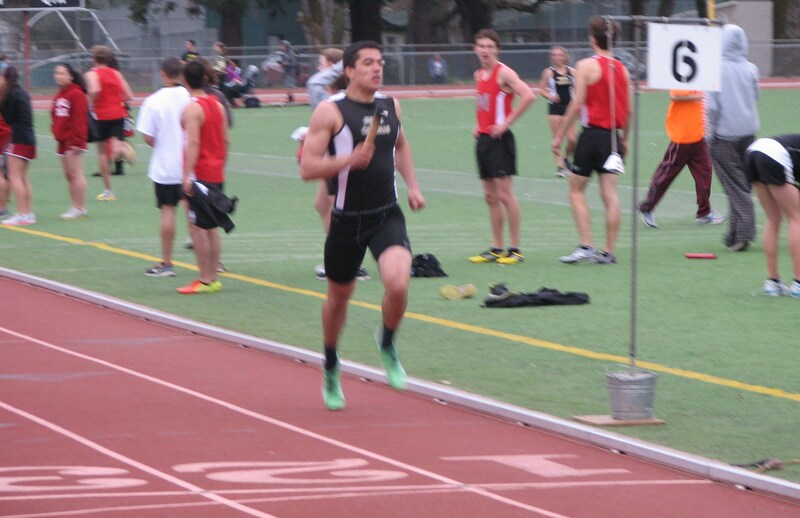 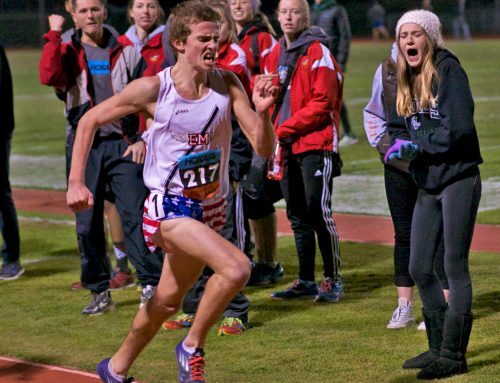 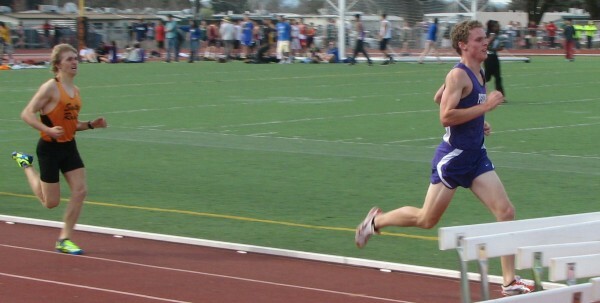 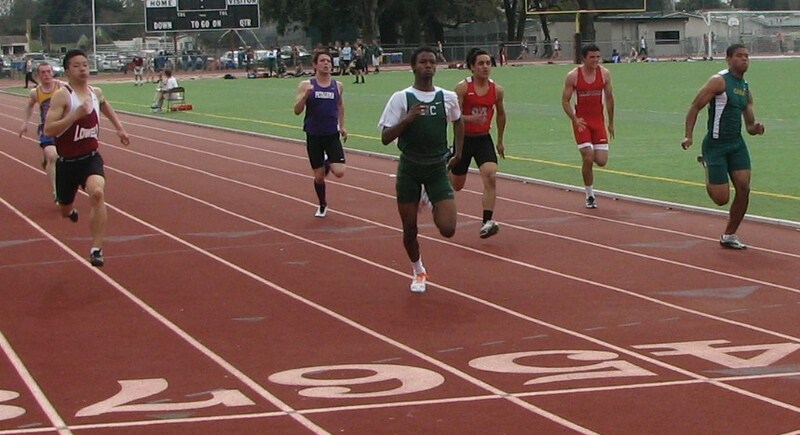 On the boys side Petaluma had wins by Teddy Scranton (DT 144-10) and Ryan Douglas (1600 4:27.69). 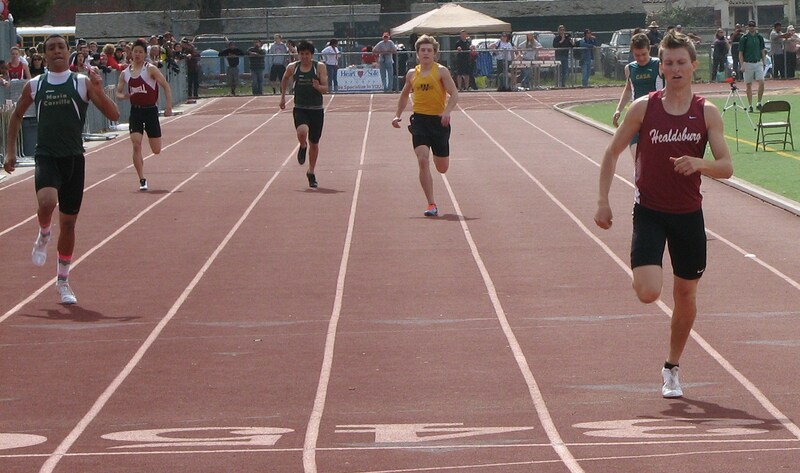 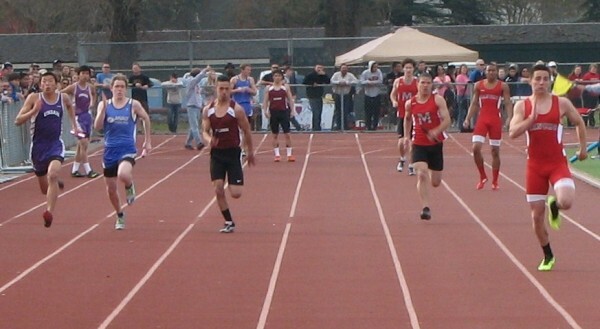 Windsor got big wins from Zach Price (800 1:59.56) and Andy Kotval (PV 13-0). 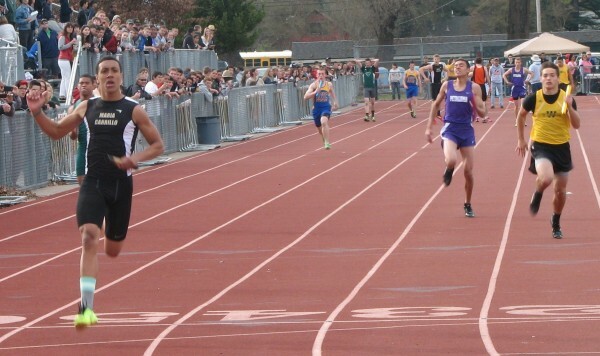 The 800 had a very strong field, with Price making a strong move to pass many top notch runners down the final stretch. 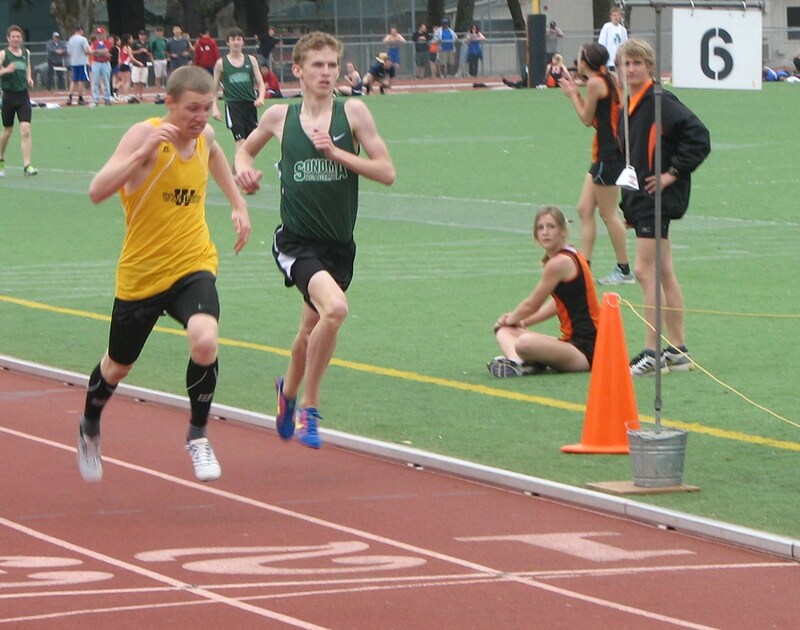 “I wanted to stay with Douglas. 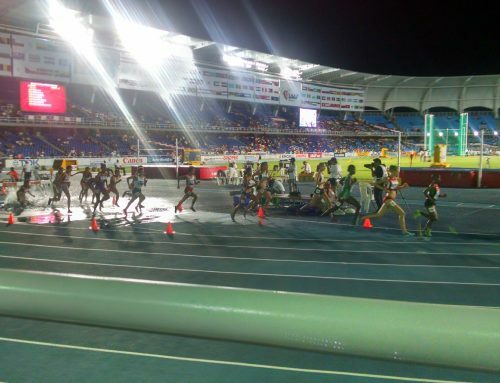 With 200 left I moved out into lane two and just went all out,”said Price. Healdsburg’s Andrew Kozel blazed the 400 in 50.63. Maria Carrillo earned wins by Ryan Anderson (3200 9:43.13), Alex Netherda (300IH 41.66) and Dantae Garcia (TJ 42-11). 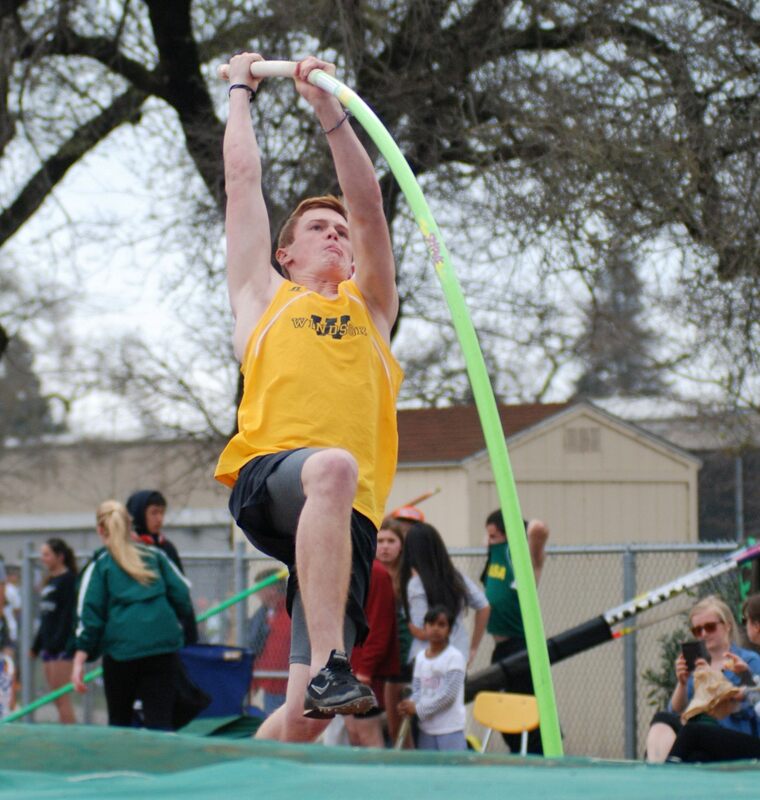 Other local winners included Brycen Poarch, Casa Grande (LJ 21-4¼), Nolan Nagle, Cardinal Newman (SP 52-6) and Justin Zinnerman, Rancho Cotate(HJ 6-4). 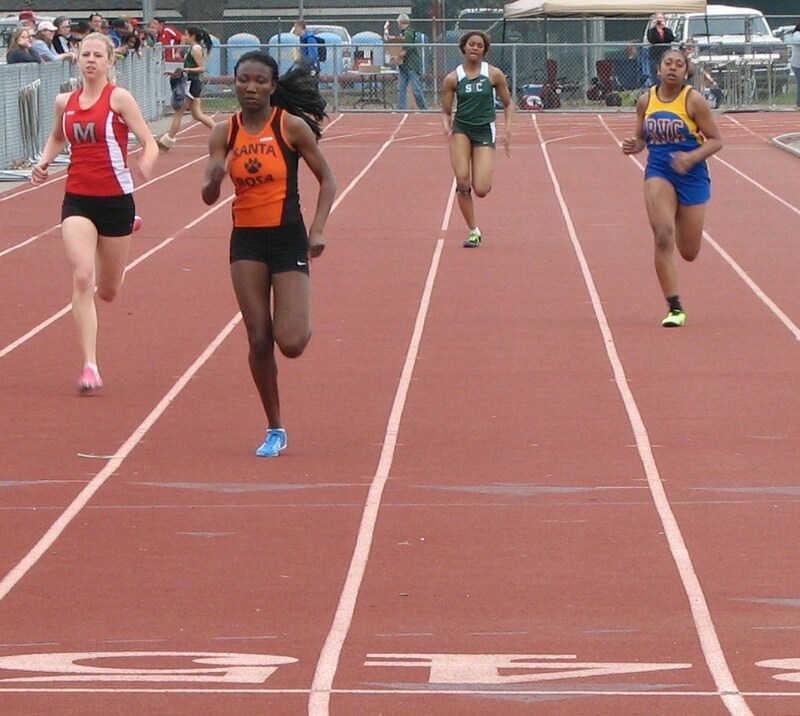 Casa Grande's freshman Destiny Williams anchors to victory.